I wonder if it is possible to alter (or extend) path finding of trains to behave more "smart" on intersections. What i mean is, when a train approaches an complex intersection, it locks all in-going traffic, regardless if paths would be occupied by the approaching train path or not (you can see the path while sitting in the train). But what if a second train would approach the intersection and simply checks if the path of the intersecting train is connecting in any way with its own path. If not, the signal would be blue for the second train and it would be allowed to enter the section. This would drastically speed up traffic. Not only can multiple trains use the same intersection at once, they wouldn't need to stop and accelerate again. This could make a great (and long overdue) train upgrade as well. It would also open up smaller trains as an valid alternative to belts in mid range scenarios. As of now, any intersection slows down traffic by an insane and unnecessary amount (because small trains are fast and the distances would be small). I'm well aware that it is possible to create workarounds for this problems (which i really enjoy). However, it would still be challenging to create networks that make smart use of a feature like that. This is exactly what chain signals do. 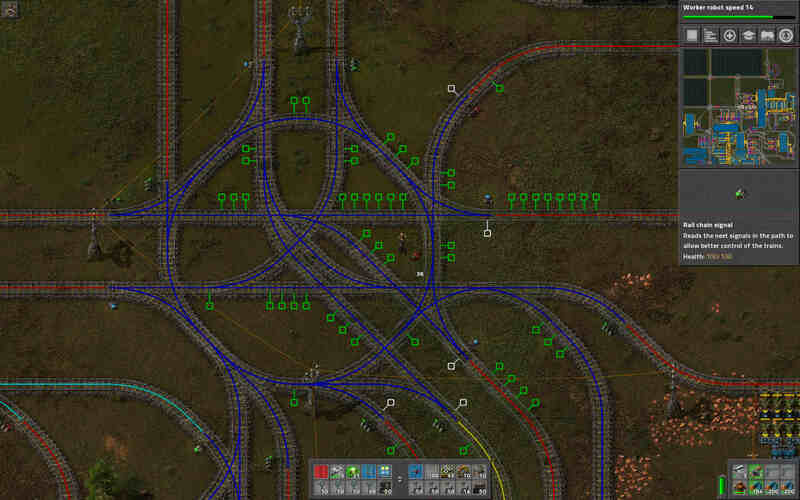 Break up your intersection into tiny blocks with chain signals, and a train will only reserve the blocks it needs. (You could also do it with normal signals, but then the train will sit in the middle of the intersection if it has a partial path). Whenever i try to put chain signals in between they just start flashing on every position. As said, this setup uses a lot of smaller supportive trains from and to smelters, reloading stations, in- and outputs around the base for mid and short range transportation. Other approaches do work, but this was more a technical question because even trains passing each other on opposite rails would force one of them to stop regardless. So the idea was to check for path intersection on occupied blocks to increase traffic flow, not how to work around this specific problem or build bigger intersections. This was moved rather quickly to gameplay help, and since i am no programmer i assume it is a stupid question. I wouldn't know so i apologize. Your intersection is too crowded to fit all the chain signals it needs. The only solution is to make it bigger and more spaced out. Recommendation: Keep it simple ! Haha, that is a great intersection.... for all the wrong reasons. As stated, you need to simplify. The thing is, since all trains had to stop anyways i wanted to create the fastest possible route to save some time. That was the only way i could come up with to further tune the network. On the plus side, i never ever have deadlocks, no matter how many trains i send in. Its not a real problem anymore now that i have switched to dedicated reloading/smelting areas on this map. @Skeletpiece, since all trains are taking a right turn all the lamps are yellow. But i assume if one of them would go straight the first chain light it encounters would be blue and the train would stop before entering the intersection, right? And what to do when i want to add additional tracks to that ring, i just make one corner larger until i can put in another chain light in between the new fork? And may i ask you to go a little bit into detail about the setup? Its really hard to see on that gif. But thanks for the replies, I'll take a look at those as soon as possible (HDD crashed, waiting for the new one to arrive). The thing is, since all trains had to stop anyways i wanted to create the fastest possible route to save some time. That intersection you pictured is one giant block. That means it can only contain one train at a time. If you can separate the different routes into different blocks, you can have 2 (or potentially more) trains in the intersection at a time. eg an eastbound and a westbound train can both proceed straight through at the same time. That potentially doubles throughput. viewtopic.php?f=194&t=46855 contains a collection of 4-way junctions. A medium throughput 2 track junction can do around 40 trains per minute. (The highest throughput 2 track junctions are huge, but can do 90 trains per minute). Even a simple roundabout (eg the one skeletpiece pictured) can do around 30 trains per minute. OK, i get it now. The idea i proposed was not only stupid but also outdated. Should read the forums and patch notes more often. So i just intersect with chain signals and do not worry about train length as long as there is a chain signal at the entry and a rail signal at the exit of the intersection. You do need to worry a little about train length. The train needs to fit in the exit block after the intersection, otherwise it might not clear the intersection. For a more detail see viewtopic.php?f=194&t=18621.